Do you want to learn more about your emotions? In addition we provide tips on asking your "feeling question". This will really help you stay focused when using The BitterSweet Score Tool. As an added bonus, after reading the book, you can retake The Success BitterSweet Score assessment so you can compare your scores. It's delivered to you instantly and costs only $1.99! 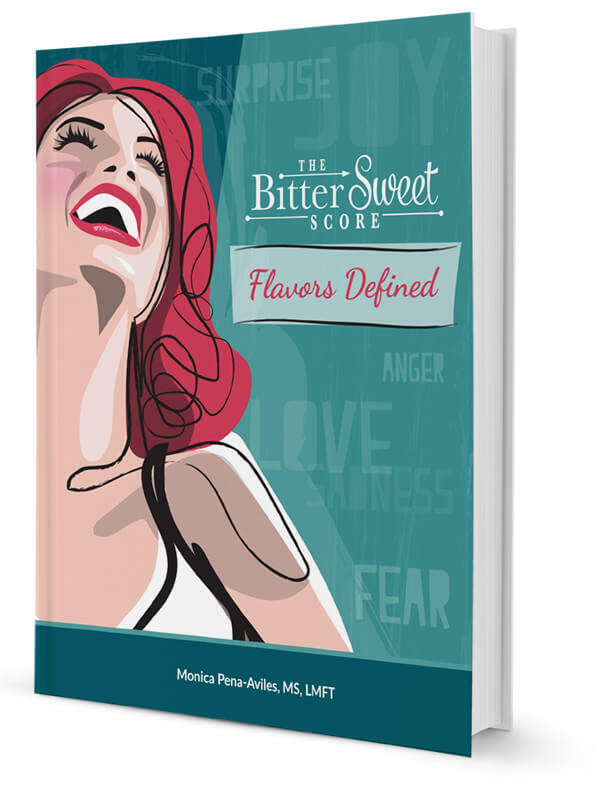 Get your copy of the BitterSweet Score - Flavors Defined today for just $1.99. We have been raised in a culture that favors the use of “reason and thinking” in our decision-making process over how we feel. In truth, the reality is quite the opposite; how we feel is what truly influences our decisions. A major challenge most of us face is that we do not understand how we actually feel nor do we have an effective way to translate and measure our feelings. We all have an inclination of how we feel, but not a true understanding of what lurks beneath, rumbling inside, motivating our day-to-day actions. This missing understanding of feelings dictates the course of our lives and impacts our relationships, our work, basically our every waking moment. The purpose of The Bittersweet Score (BSS) is to help you learn how to explore and use your emotions. By using the BSS measurements you can better understand your feelings and dominant emotions surrounding a situation and then harness those emotions to make better decisions. The first step in effectively utilizing the BSS is to explore each flavor, or rather emotion. By having an idea of what each emotion is you will have a greater ability to use the BSS to channel your true feelings and choose the path you wish to take. There are loads of assessments available on the Internet. Some are serious some are fun. We wanted to combine a bit of entertainment with the “grown-up” topic of emotional understanding. When we started the BSS project, the goal was to compare success to a flavor, hence the question, “What flavor is your success?” This is how we got to ice-cream. After a little bit of research, we were able to select six ice-cream flavors we felt represent the six primary emotions: Love, Joy, Surprise, Anger, Sadness and Fear. No matter how old you are, everyone can relate to ice-cream. We could have used shapes or colors, but what fun is that… Ice Cream is cool (no pun intended)…so let’s dig in! What Flavor Is Your Success? Did you score a Napoleon, equal across Strawberry, Vanilla and Chocolate? What do these flavors mean? Were you Bitter or Sweet? If you were curious to know more, then you elected to upgrade and purchase this eBook.